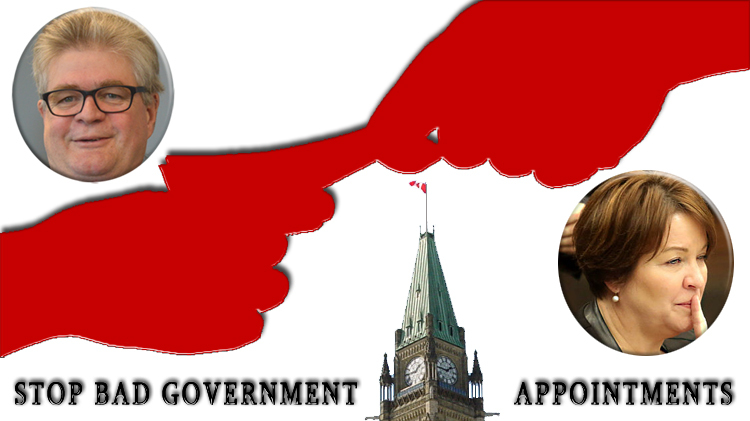 OTTAWA – Today, Democracy Watch is in Federal Court in Ottawa for the hearing of its case challenging the Trudeau Cabinet’s appointment in December 2017 of the new Lobbying Commissioner. Democracy Watch argues that the Cabinet was biased and in a conflict of interest because, at the time of the appointment, the Lobbying Commissioner was investigating three situations involving lobbyists’ putting Trudeau in a conflict of interest. See details about those situations here and here and here. The Commissioner was also investigating another situation involving Minister Chrystia Freeland. Also, the Cabinet failed to consult with opposition party leaders as required by subsection 4.1(1) of the Lobbying Act before making the appointment. The Cabinet hid the fact that it had qualified candidates for Lobbying Commissioner in spring 2017, and controlled the partisan process in secret right through to the end of November 2017 when Prime Minister Trudeau made the unilateral decision to appoint Nancy Bélanger. Democracy Watch is represented by Sebastian Spano. Prime Minister Trudeau recused himself in mid-May 2017 from the Ethics Commissioner appointment process because the Commissioner was investigating him for accepting the Bahamas trip gift from the Aga Khan. In contrast, he didn’t recuse himself from appointing the Lobbying Commissioner. After the May 2017 fiasco in which the Liberals tried to impose a blatantly partisan appointee for Official Languages Commissioner, the opposition leaders wrote a joint letter to the PM calling on the Cabinet to consult with them, as required by law, on all officer of Parliament appointments. The NDP also proposed a resolution in June 2017 that a committee of MPs review nominees for Lobbying Commissioner and other watchdog positions but the Liberals rejected the proposal. Democracy Watch’s court case has revealed that Prime Minister Trudeau then sent a letter on June 20, 2017 that misled opposition leaders by claiming the Lobbying Commissioner appointment process was transparent and merit-based while failing to mention that the Liberals had already found qualified candidates for the position, and failing to consult the opposition on those candidates. Then-NDP Leader Thomas Mulcair sent a letter back to Prime Minister Trudeau on July 4, 2017 saying the Cabinet’s appointment process was not independent, transparent or non-partisan, and again proposing it be changed to involve opposition parties. Prime Minister Trudeau didn’t respond to Mulcair’s letter, and he and a Cabinet committee then controlled the partisan appointment process in secret right through to November 22, 2017 when he sent opposition leaders a letter saying that he had decided to appoint Nancy Bélanger as Lobbying Commissioner, and gave them only one week to respond. The NDP sent a letter on November 29, 2017 to the Prime Minister saying very clearly that it’s position was that it was not consulted before the appointment of Ms. Bélanger was made, and requesting to see the shortlist of candidates. The Conflict of Interest Act and PM Trudeau’s code for ministers and the law of bias all prohibit ministers from taking part in decisions when they appear to be biased or have an opportunity to further their own interests or improperly further another person’s private interests. Prime Minister Trudeau and his Cabinet had a clear opportunity in appointing the Lobbying Commissioner to further his interest by choosing someone whom they thought would issue a ruling finding the lobbyists not guilty of putting him in a conflict of interest. In fact, one month after Prime Minister Trudeau appointed Nancy Bélanger as Lobbying Commissioner, she issued a ruling letting Apotex Inc. off the hook even though its chairman, Barry Sherman, held a fundraising event Trudeau attended that raised $150,000 for the Liberal Party. Democracy Watch has challenged that ruling in court. More than 15,000 Canadians have sent a letter through Democracy Watch’s Stop Bad Government Appointments Campaign calling on the federal Liberals to change the Cabinet appointment process from the current partisan system to ensure actually independent and merit-based appointments of all judges, officers of parliament, and members of agencies, boards, commissions and tribunals. “The only way to stop the current dangerously undemocratic and unethical appointment process for judges and government watchdogs is to establish a fully independent public appointment commission, as Ontario and Britain have, to conduct public, merit-based searches for nominees and send a short list to Cabinet, with Cabinet required to choose from the list,” said Conacher. The independent commission, whose members would be approved by all federal party leaders (and entities such as the Canadian Judicial Council) should be mandated to do a public, non-partisan merit-based search for candidates for appointment as officers of Parliament and as members of the 32 federal administrative tribunals and 108 agencies/boards listed here. For all appointments, Cabinet should be required to choose appointees from a short-list of one to three candidates that the commission nominates. The judicial advisory committees for appointments of all 1,123 federal and provincial superior court judicial appointments listed here should also be made more independent from the federal Cabinet (currently the Minister of Justice chooses all the members), and should provide only a short list of candidates (currently they send long lists to Cabinet). Democracy Watch also called on the Liberals, and all governments, to change the law to ensure all Cabinet appointees who watch over government or oversee key democracy laws (especially every Officer of Parliament) serve only one term, so they don’t try to please the government in order to keep their job.